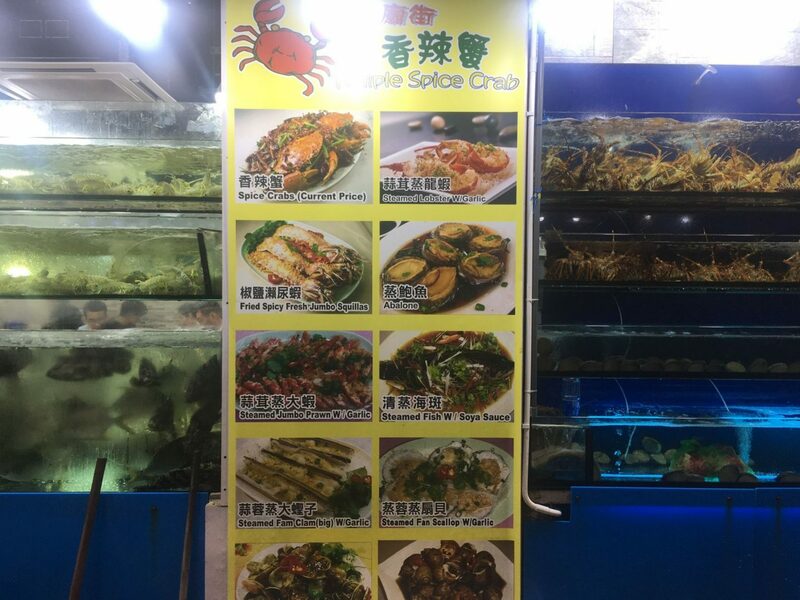 If you’ve read my recent post Hong Kong: A Foodie’s Dream, you’ll know that this was a spontaneous trip planned on a night out. 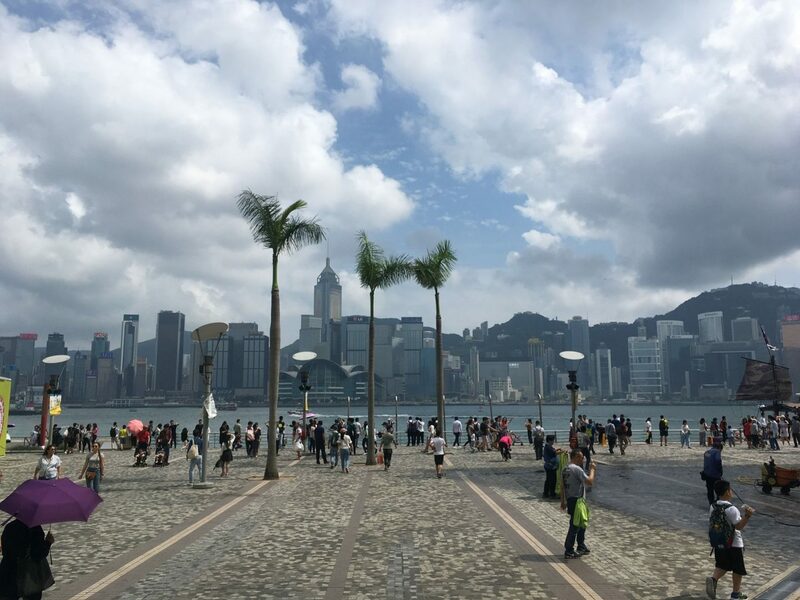 Hong Kong had never been on my bucket list and, as a result, I had no idea what to expect. Once flights were booked and there was no turning back, it was time to start planning. I’d be travelling with my friend Aliss, so we spent many a Sunday afternoon in the pub discussing what we wanted to see and do during our trip and getting more and more excited. 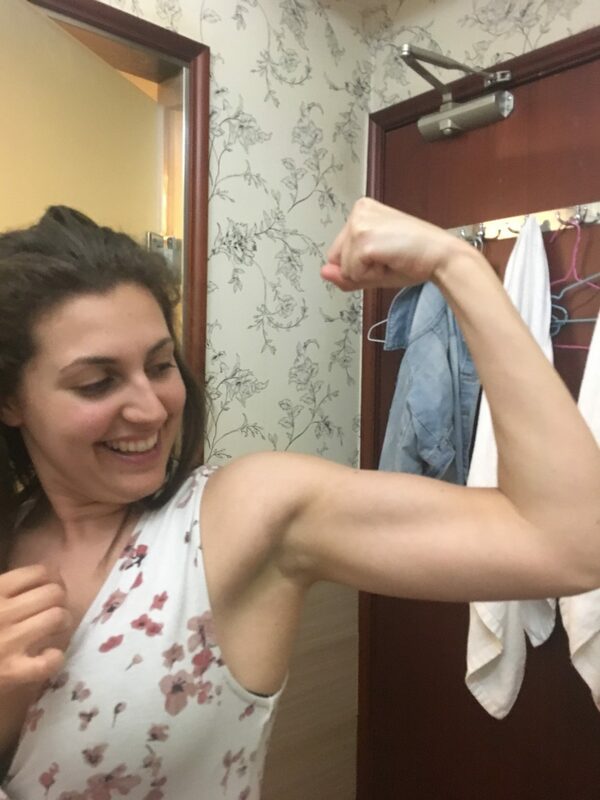 Our only concern was how on earth to fit in everything in to 6 days! We created an itinerary which we didn’t stick to, but it did serve as a check list for our must-see places. I’m not usually much of a planner for holidays as I much prefer to wander aimlessly and find my own adventures, but in this case it was really useful. 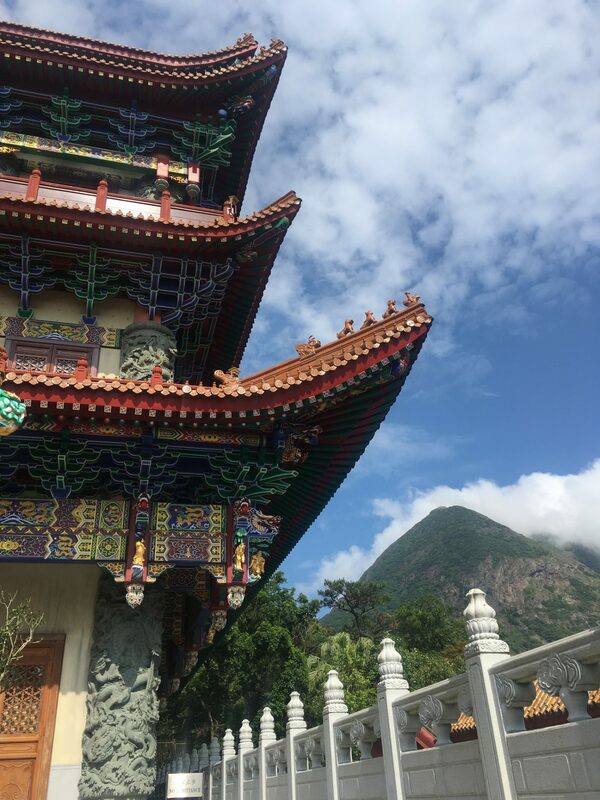 If you’re planning a trip to Hong Kong and, like I did, have no idea how to best use your time there, please do read on and pick and choose bits to create your own adventure! I arrived in Hong Kong at 8am and took the Airport Express and then the Metro to meet Aliss at our hotel (if you can call it that!). Successfully navigating public transport in a strange city all by myself was one of my proudest ever moment! Quick tip: buy an Octopus card at the airport to pay for the train into Hong Kong and then pretty much all transport whilst you’re there! As you can see from the length of the above sub-heading, we were very excited to be on holiday and were keen to make the most of our first day. So after a quick breakfast, we jumped on a bus and headed to the seaside village of Stanley. We loved meandering through the markets, eating street food on the seafront and dipping our toes into the crystal clear sea. Looking back on the trip as a whole it was probably the least impressive place we went to, but a fantastic way to ease ourselves in to the holiday. Back on the bus, we headed back towards the city and jumped off when we saw a street that we liked the look of (literally just some steps with lanterns but it looked so pretty!). 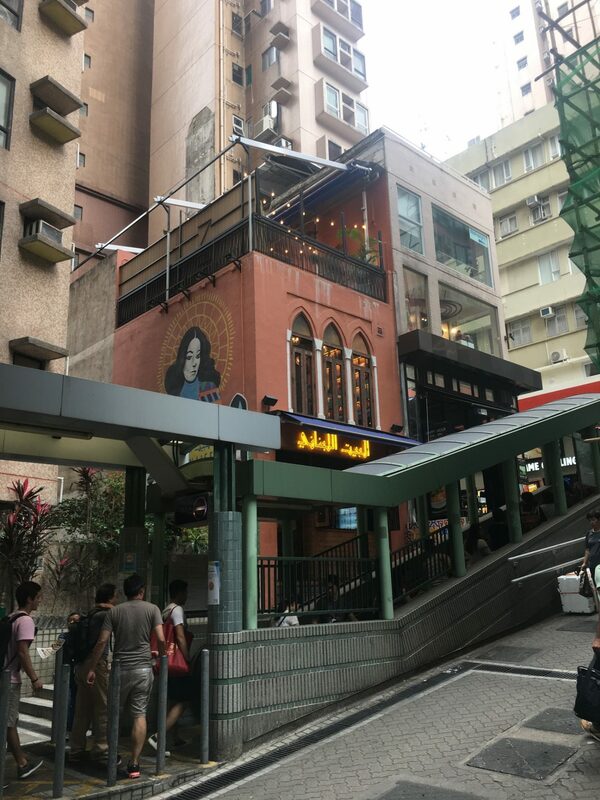 We headed through more markets until we stumbled upon the Central Mid-Level Escalator, which we’d put on our itinerary for later in the week. This is the longest escalator in the world, but to be completely honest we were a little disappointed. It was indeed long, but at the end of the day it was just an escalator with nothing really at the top! Unsure of where we were, we wandered as lost souls hoping to find our way when we stumbled across the Zoological Gardens! This was a great surprise, and we spent the next hour wandering amongst monkeys, tortoises and meerkats… for free might I add! From here, we carried on walking (feet starting to hurt at this point) and followed some signs to Victoria Peak, which happened to be on our itinerary as a planned activity for that day! The most popular way to go up the Peak is the tram, but when we arrived the queue looked endless… a good few hours wait. So instead we hailed a taxi and a few minutes later we were at the top. Yes we missed out on the iconic tram, but we skipped the queues and the taxi was much cheaper so totally worth it. Although a tourist trap, it’s definitely worth going up for the breathtaking views. 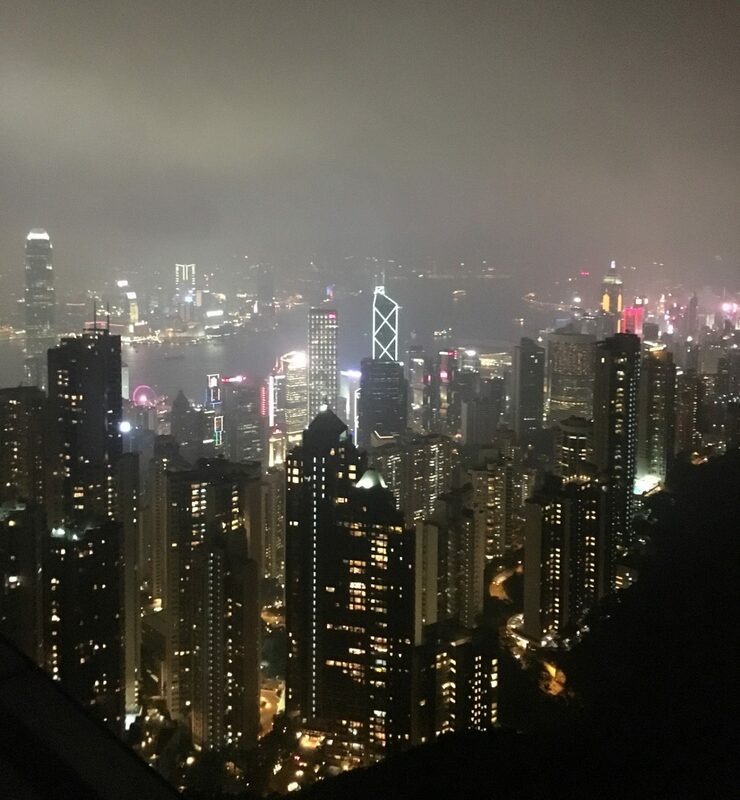 We timed it perfectly because we got to see Hong Kong go from day to night, and headed up to the viewing point to watch the light show. We planned to get a taxi back into the city, but due to this being a very busy time the prices soared (we paid less than a fiver to get up there and they wanted to charge us £80 to get back down). This is when we learnt a very important lesson… do not get a bus down from the Peak if you suffer from motion sickness or don’t enjoy fearing for your life. This was probably the worst travel experience I’ve ever had, and I think we both genuinely thought we were going to die. When we were finally off the bus, we had to sit on the pavement for 5 minutes, taking deep breaths. 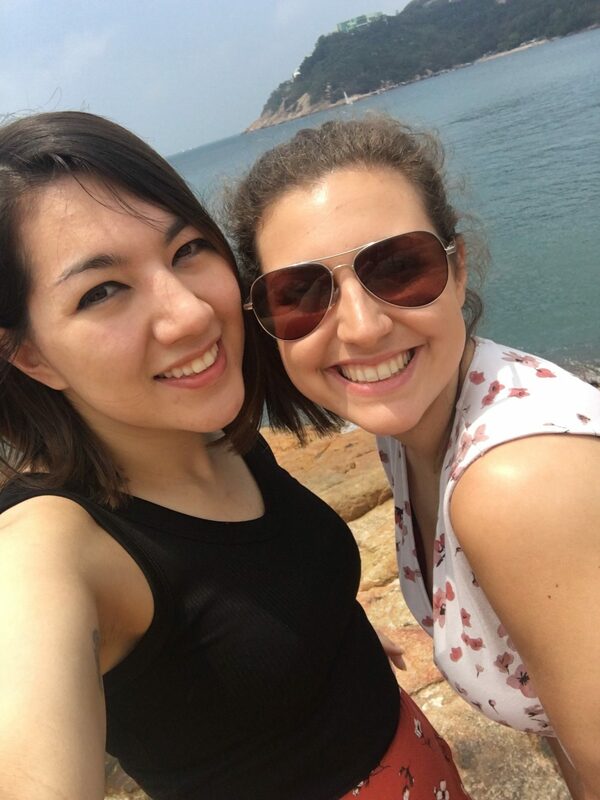 Today we took the Metro to Lantau because it wouldn’t be a trip to Hong Kong without an obligatory selfie in front of the Big Buddha. 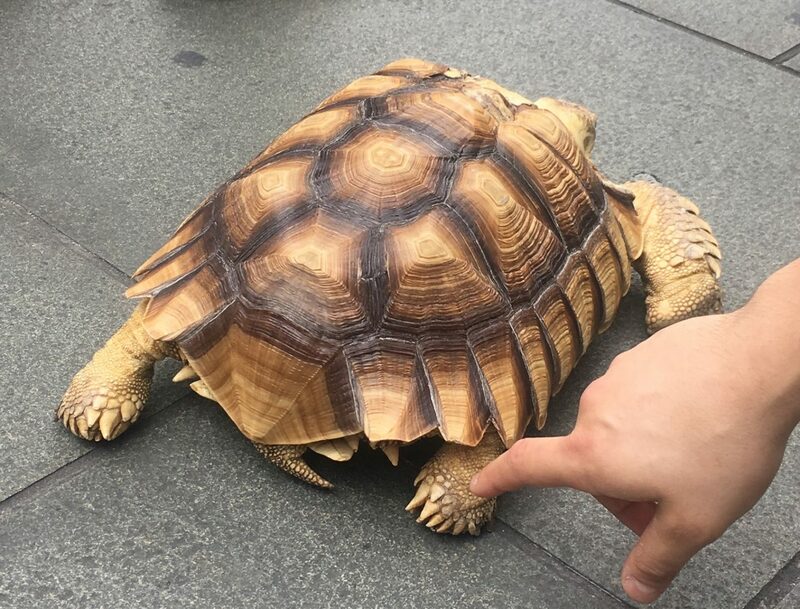 First highlight of the day was coming out of the station to see a large tortoise exploring the square! 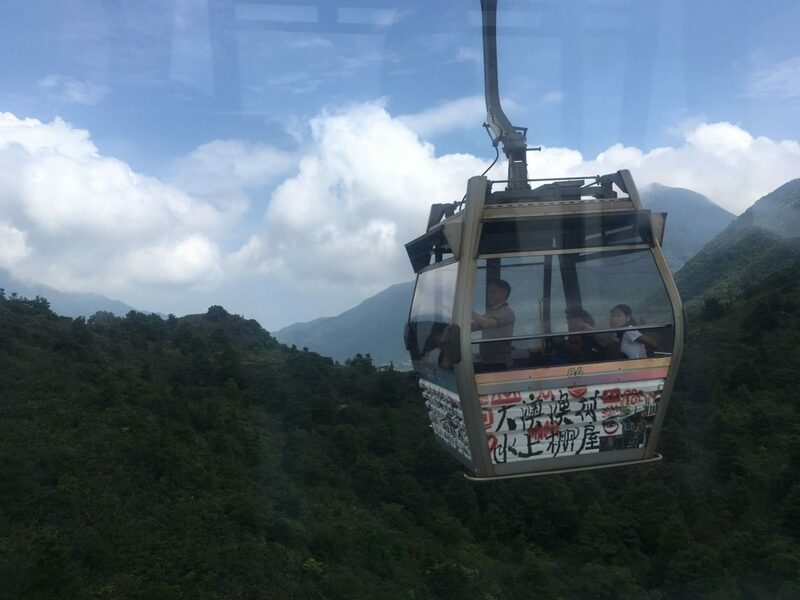 If I could give you one tip (other than to avoid the death bus down from the Peak) it would be to buy tickets for the Ngong Ping 360 cable car on your phone. We bought these through the Klook app on the day and not only was it a fair bit cheaper than buying tickets in person, it also meant that we got to walk past the very long ticket queue and straight into the fast track lane. We still had to queue, but for about 40 minutes rather than several hours. The cable car was great fun and the views were stunning, especially as the Buddha appeared over the hill tops. When we got to the top, first impressions were that it felt a little in-authentic and touristy. 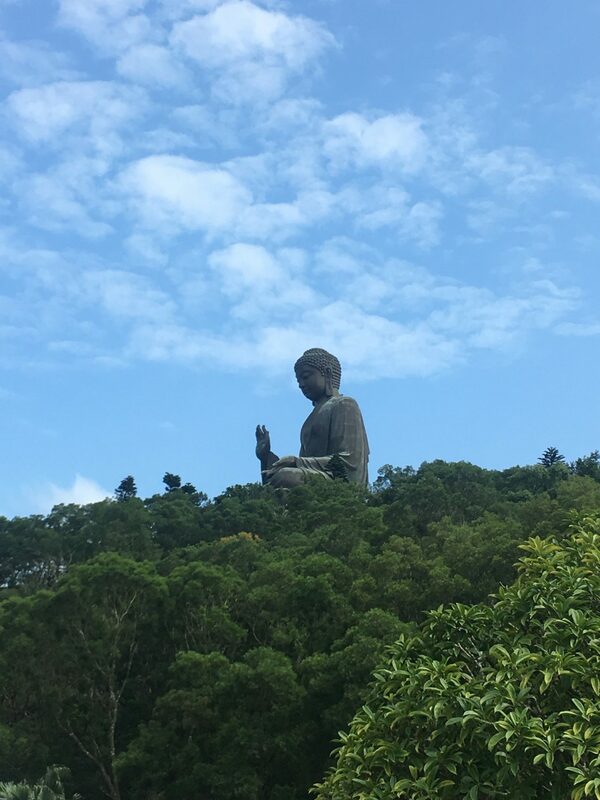 However, as we got closer to the Big Budha and the beautiful Po Lin Monastery these feelings faded and it turned into a must-visit location. 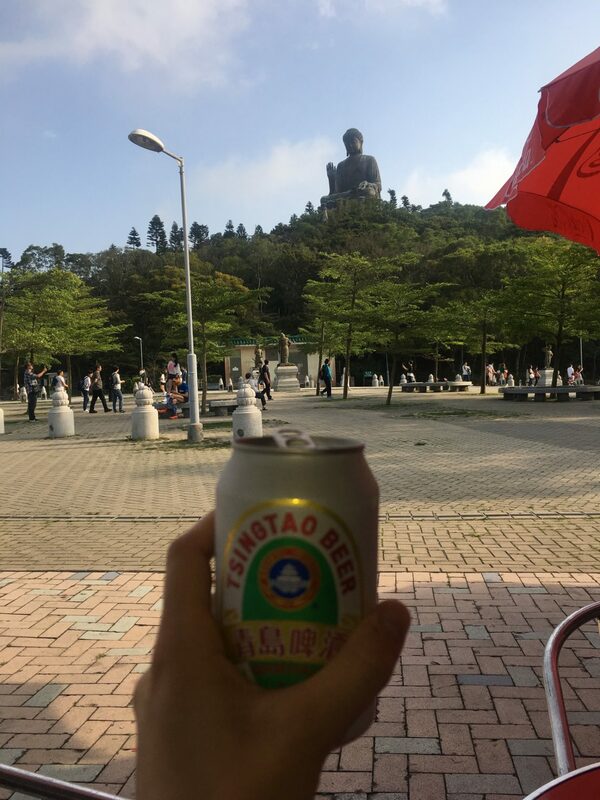 As we looked around the Monastery we listened to Monks chanting, before enjoyed an ice cold beer looking up at the Buddha. As jet lag was still hitting hard, we headed back to our hotel for an early night, stopping for some dim sum on the way. My favourite thing about being on holiday is exploring without a plan, so today was all about that and we covered A LOT. We headed out of the hotel and just wandered! 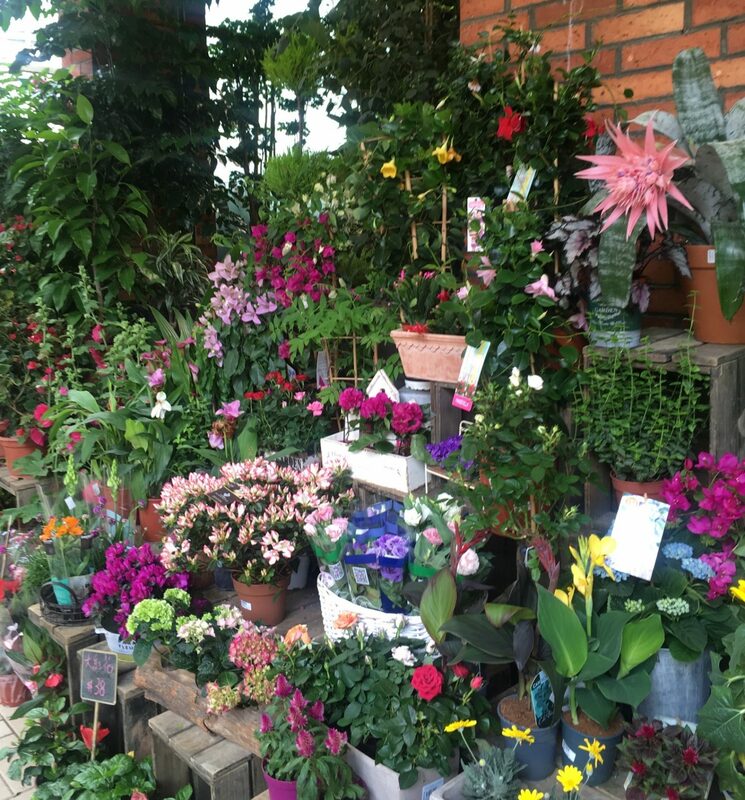 Soon enough we discovered the Flower Market, where every shop front was lined with the most stunning flowers… I’ve never seen Orchids like the ones here and the scent was just heavenly. With a little more wandering, we came across the Yuen Po Bird Garden. I’d read about this garden: a place where locals take their birds for a day out to meet other birds. How lovely! Unfortunately it was closed due to a bird flu threat, but we stood on a bench and had a little peer in. Next we hopped on the Metro to Tsim Sha Tsui and wandered around here, in to a lovely tea shop. From here we continued over to the waterfront and just sat admiring the views. It was absolutely gorgeous! Keen to continue exploring, we decided to get the Star Ferry across the harbour and explore some more of Hong Kong Island. After refuelling on dim sum from the World’s cheapest Michelin Star restaurant, we went for a ride on the Ding Ding! Our feet were sore but we still wanted to see more sights, so we took a seat at the top of the ding ding (tram), stuck our heads out of the window, and watched more of Hong Kong pass by. Exhausted and in need of a drink we headed into the nearest bar for a very expensive cocktail. Despite having achieved a lot that day, it was still early so we headed back to Mong Kok to explore the night markets. I think you go here for the experience and the buzz rather than the bargains, as it was mostly just tacky souvenirs, but I did buy some gorgeous noodle bowls and chopsticks! The best bit was the fortune tellers who we paid far too much money to be asked ‘do you have a boyfriend?’ and then told ‘ahh you will get married soon’. We were also asked ‘do you want children one day?’ before being told ‘ahh you will one day have children’. After a long day we headed for dinner and then another early night (we’re wild as you can tell), ready for another day of exploring! So as not to bore you (I get excited when I write and struggle to keep my word count down) I’m splitting this post into two parts. I’ll be posting again in the next couple of days but subscribe if you want to make sure you don’t miss out! In the mean time, I’d love to hear if you’ve been to Hong Kong or ever thought about visiting. What are your must-see places in this wonderful city?